Saint Eustachio is the hallmark of this small cult bar in Rome. So it is no wonder that this coffee tastes heavenly. For all ESE Espressopad friends a must. 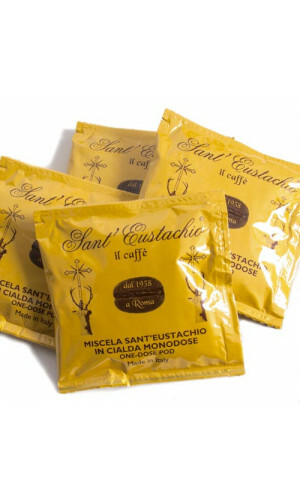 Sant’Eustachio Whole Beans are ideal for coffee perfectionists, who prefer to grind their beans at home by the cup. Smooth and sweet with low acidity. 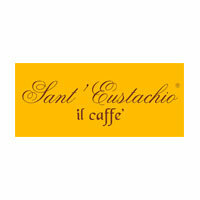 Anyone in Rome will tell you that the best coffee can be sipped at the Caffe' Sant'Eustachio in the center of the city. Sant'Eustachio Il Caffè is an ancient Coffee Shop and Roaster founded in 1938 and located in the heart of Rome. The symbol of Sant'Eustachio Il Caffè is a stag which recalls the apparition and conversion to Christianity of the previously pagan Eustace. Sant’Eustachio Espresso is made from 100% Arabica beans. This is the only coffee in Rome to still use wood for roasting, rather than fossil fuels, with each 100% Arabica batch roasted on the premises of the café. The beans have an a aroma remiscent of chocolate, while the roast is not as dark as expected, it brews a lighter, flavorful coffee. Comes in the beautiful tin you see, which also makes it a perfect gift for your favorite coffee lover. Selecting the best coffee varieties and offering now also their famous coffee as ese pods prepared with a legendary secret blend. With a very low caffeine content - less than 1.2% - this is truly a coffee for coffee lovers, light enough to enjoy after every meal.